I just smiled. I viewed his remark as a compliment, because I don’t like to go around taking photographs of stuff that everyone else thinks is beautiful or interesting. If I am going to go to the trouble of taking lots of pictures, I may as well try to portray the things I see that others don’t see. After all, isn’t that the point? 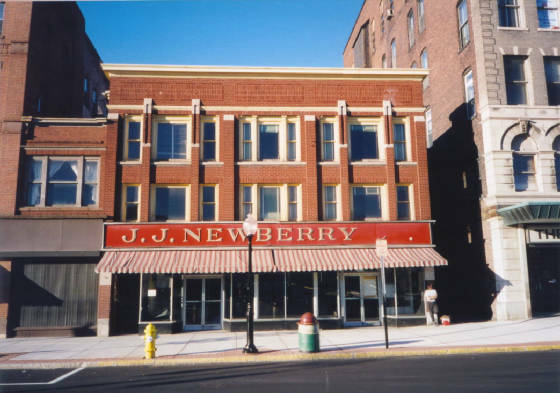 The empty J.J. Newberry store is one of my favorites. I have a 20″ x 30″ hanging in my living room. Click on the photo to enlarge it. Many of the photographs in this gallery are shots of ordinary scenes: houses, mills, streets, doors, windows, signs, empty storefronts, and the urban landscape. They are the commonplace things that most people walk by every day and never notice. Once in a while, I capture something beautiful and extraordinary, too. As a writer and photographer, I make it my business to notice everything. Click on North Adams Photos below to see more than 200 of my photos of North Adams. Click on Other Photos to see many photos taken in New England and other locations.